Love, Simon is the kind of teenage angst drama that the late John Hughes used to turn out a dozen at a time during the 80’s. The only difference is that this is a relevant tale that isn’t another boy falls for girl tale but boy falls for boy. For the first time, a major Hollywood studio has produced an LGBTQ film that anyone can watch and relate to. It’s smart, sharply observant and full of heart. Simon Spier, as he describes, is an ordinary guy who comes from a loving family, a sister who loves cooking and is surrounded by close friends. Simon, however, has a secret: he is gay yet no one in his life knows. He starts making a connection with a mysterious boy online but hasn’t a clue who he is. After a fellow student discovers the emails and starts blackmailing, Simon struggles to keep his friendships together while keeping his secret and satisfying the blackmailer. Without playing around with the Hughes cliches of high school life, characters that come from the good side of the tracks, quirky staff members and the pains of being young, Greg Berlanti’s film version of Becky Albertalli’s best selling novel has enough to feel comfortable while bringing it right up to date with references (a mention to Barack Obama), technology (emails, facetime all used but never overused that you spend your time looking at text) and more importantly, sexuality. This is much more than a coming-of-age comedy but it allows the audience to see that it’s fine to be you, no matter what you want to be. Simon dispels the usual homosexual stereotypes. He is not flamboyant and doesn’t dress outrageously but looks like every teenage young man. In fact, in one amusing scene, Simon has his own fashion show, dressing how other gay men allegedly dress but choosing to just be himself. What’s also refreshing is that this isn’t a boy meets boy affair but is more like a whodunnit. Simon emails the mysterious Blue without knowing who he is but falls in love with his words. He then spends his time imagining who Blue is from little clues that are dropped, leaving the audience guessing as well. Then there’s the relationship between Simon and his friends. You genuine feel the closeness and so part of the heartbreak is that Simon cannot bring himself to come out to them. Not that he is afraid but that he is being manipulated by his blackmailer. You do think that he could have just come out to them and everything else would have been fine but obviously, for the sense of storytelling and tension, this would have been a far shorter film. Yet you feel his heartache as he has to deceive his nearest and dearest in order to keep his secret. The film is brimming with poignant moments, from the conversations with Blue online to a beautiful speech from his mother to an ending that is both touching and slightly too sentimental. However, none of this really matters as you find yourself shedding a tear of happiness. The cast is terrific, with Nick Robinson extremely likeable as Simon, the young man living in confusion. Jennifer Garner and Josh Duhamel on top form as his parents. The film is stolen by Tony Hale as the wannabe hip vice Principal and Natasha Rothwell as a drama teacher with a collection of sharp put-downs. I really liked Love, Simon. 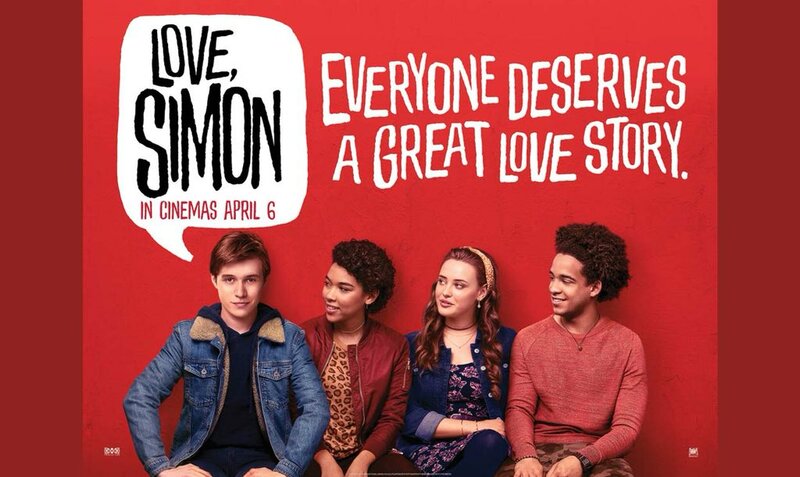 It’s so refreshing to see a mainstream film dealing with LGBTQ issues. Normally only seen in International or independent cinema and usually in heavy issue dramas (Moonlight, Call Me By My Name etc), it’s exciting to see it in a film that is available to the masses and what’s even more encouraging in how people are taking the film to their hearts. At the end, it’s a love story and who doesn’t like a good, well-written love story?